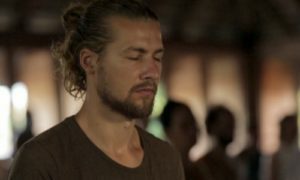 Rosanna Osterlund and Will Allen are two Hridaya teachers who fell in love with each other while falling in love with life at the Hridaya Yoga Center in Mazunte. In combination, this pair of aspirants has a uniquely complementary set of passions. This month, they have agreed to answer some questions about their brand-new endeavor in Sweden for our Branch Spotlight. What is your name and what are you doing at the moment? Our name is Rox & Will Teach Yoga. We can be found online on Facebook or on the web at roxandwillteachyoga.com. Both of these online platforms serve to share upcoming events, workshops, classes, and retreats. We also intend to begin offering teachings in the form of articles and videos. The site will be dedicated to teaching meditation, yoga, and the insights that come with practice. Currently, we are offering our Deep Peace Silent Retreat. It is a 5-day silent meditation retreat, with Hridaya Hatha Yoga and Hridaya Meditation sessions supplemented by relevant spiritual discourse. We are hosting this event at a beautiful retreat center in the forest two hours outside of Stockholm, Sweden. All Hridaya students are eligible for a 20% discount on this retreat when registering before February 7th. Simply mention your Hridaya affiliation to receive the discount. Where is your branch located? As we grow, we plan to lead retreats all around Europe, initially focused on the Nordic countries. In addition to retreats, we hope to build a base in Sweden in order to offer regular Hatha Yoga classes and go deeper on our own spiritual path. We love teaching yoga and meditation in order to see the deeper insights that come with authentic spiritual practice. To us, this means helping others live life in greater integrity with their hearts. Inspiring those who attend our classes to take the beautiful risk of living with an Open Heart. Not giving them delusions of “this is easy and everything will be so nice after,” but inspiring them to open their hearts even to the pain and difficulties of life. That even in―maybe especially in―difficult situations and circumstances that living with an Open Heart is absolutely beautiful and worthwhile. Making sure everyone knows that this is possible and not just an ideal. And of course, to be compassionate with ourselves in this, to forgive ourselves and be easy with ourselves when this feels like too much. Yet, always aspiring to continue to open to moving in love and compassion. How long has the project been operating? We are just starting out. Now is a crucial time in this project. We are moving in love and deep dedication to sharing the beauty of the Heart. While we have experience in teaching, we are new to the administrative side of this and are learning fast. What is special about your project? Our partnership is definitely a unique and very fulfilling teacher. The two of us really balance each other out and we work in a beautiful harmony. Rosanna has a love for the body, health, and movement. She has studied Ayurveda and herbalism and has practiced various forms of yoga. She really brings a holistic attitude towards health and is constantly going deeper in her understanding of how to care for the body. Her love of movement brings something special to her Hatha Yoga sessions. Will has a keen insight into human psychology and the strategies and compensations of the mind. His passion is meditation and he loves listening to spiritual lectures and reading books on both spirituality and psychology. Also, he has lived in deep and committed dedication to his spiritual path and practice since he first came across Hridaya in 2012. He later spent three years living in the United States while in absolute commitment to his spiritual maturation and formal practice—despite being surrounded by many living with fear-based patterns of conditioning. From this, Will has a special relationship with deeply integrating the fruits of practice. Can you mention your future projects, if any? As doors continue to open across Sweden and Norway, we are particularly excited about expanding our reach through our website. This gives us an outlet to touch all levels of spiritual aspirants, and we are interested in sharing digital teachings―everything from practical advice for beginner’s meditations to videos on subtle pitfalls in spiritual maturation. Ideally, this will supplement ongoing classes, workshops, and retreats. Is there anything else you would like people to know about your project? This is a movement of love. We are inspired by passion and care for others. We hope to make this a way of sustaining ourselves, yet it has nothing to do with business and we are absolutely dedicated to learning what it means to navigate this new terrain in integrity with the Heart, in absolute authenticity. This is first and foremost an expression of a deepening in our spiritual journey.